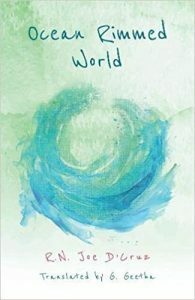 Ocean Rimmed World by Joe D’Cruz, ably translated by G Geetha, is the story of a way of life. True, it is an insider’s account tracing life as it was lived in a Tamil Catholic fishing community of Parathavars in Uvari, a village near Thoothukudi. But its sweep and depth is a tribute to the way people lived as communities barely a few generations ago. The story, set in Amanthurai in Thoothukudi district, has an overarching strand about Gothra Pillai, Soosaiyar and Siluvai, at the mercy of water currents, adrift on one of the logs from their wrecked catamaran. The accident happens on Wednesday, 17 July, 1985. And it is 23 July before Siluvai is rescued. Together with this, the narrator deftly interweaves other strands to make up a skein of colourful stories covering some fifty-five years in 500 and odd pages. The first of these, a flashback to 1930, is about three fishermen, Thomanthirai, Gothra Pillai and Bosco, preparing to set out to sea on a shark hunt. ‘Bosco took his place in the fore of the maram while Gothra stood ready at the centre. They turned in the direction of the Anthoniyar Koyil—St. Anthony’s Church—and prayed. Meanwhile, Thomanthirai, who was on the shore, removed the towel draped over his shoulder, and tied it reverently around his waist. Facing the Anthoniyar Koyil, he raised his hands above his head in prayer. He then climbed on the maram and took his position at the stern’ (p. 14). This image sets the spirit of the narrative, sombre yet hopeful, bringing divine providence into the very fabric of their lives. Further down the page, thirty year old Thomanthirai is described as ‘a great kadalodi, an accomplished seafarer’. This episode is a tribute to Thomanthirai’s ability as the more experienced fisherman to guide the two youngsters to steer the catamaran from the turbulence of the sea to the safety of the shore after a dangerous yet successful expedition. Even as he teaches them the trade as he had been taught by his elders, he gives them valuable lessons in daily living. ‘As the maram skimmed across the sea’s surface…all of a sudden, the sea was awash with large shoals of maangaai chalai… “Tch! If only we had a net!…” cried Bosco eagerly.’ But Thomanthirai uses that instance to teach the youngsters a life-skill in staying focussed. ‘… It’s just the same with our life. Often, we lose sight of our purpose, letting our hearts wander here and there, giving in to all the wayside attractions and finally ending up losing the little we have. No matter how big or small the task, we must be clear about it. Do you get me?’ They are out to get a shark; nothing else, however tasty. The women in the community are just as concerned. Thokalatha, Gothra Pillai’s wife, helps him to set up Vasantha with a grocery store when she returns with her daughter, Pechi. Mary tells Sesamma she feels bound to take care of Oomaiyan’s orphaned son, Siluvai. Here, in essence, is the togetherness that binds them as a community: the elders feel the responsibility of passing on their expertise and worldly wisdom through the very way they live and the youngsters are all eager to learn and to pass it on. As an elder, Thomanthirai is the patriarch responsible for the very moral-religious fibre of the community, teaching the wisdom they have accrued for generations. ‘These are really big fish, there’s no denying that… But as our elders have been saying for hundreds of years, these creatures are bound by dharma. They are bound to Kumari Aatha, our mother goddess, who watches over us’, he says. And, ‘Deep down, in his heart, Gothra sang praises of his guru Thomanthirai, who remained unshaken even in the most dangerous of circumstances’ (p. 22). Towards the end of the story, this very Gothra is the elder who has a life-in-death experience as he remembers to live as Kagu samiyar, their parish priest, had preached, ‘Sacrifice is more powerful than anything else in this world…’ (p. 182). The priest shepherds his flock so well that when he announces his transfer to another parish, after serving them for fifteen years, ‘… all of a sudden a deafening roar ripped across the shores across the parish church. The sea was rolling.… A voice shot out from the crowd that had gathered around his bungalow, “Sami, looks like Mother Sea herself is unable to bear the thought of your going away. Don’t go, Sami…”’(p. 125). In fact, the delineation of Kagu samiyar is a touching tribute to a priest who had served the Parathava congregation, Reverend Father Alphonse Maria Kagoo (24 April 1901-5 August 1984). As unconditional as their faith in God’s protection is their implicit trust in the sea that provides as well as devastates. Gentle dolphins are like guardian angels that rush to surround a fallen fisherman to protect him from ‘the rascally sharks’. The sea, their mother goddess, Kumari aatha, seems transcendent, ‘The first Parathi to enter the sea… She lives on in their hearts, generation after generation, transcending the bound of time’ (p. 56). And she is also imminent as their Kaval Theivam, their guardian, ’protecting the entire shore, watching over her children who set out to sea…filling our bellies and lighting up our homes’ (p. 31). They pray to her with as much fervour as they pray to Mary, the mother of Jesus, who is their mother too, their maadha. The indigenized form of Catholicism they practice stems from a blend of cultural beliefs, both Christian and Hindu. Their very names are Tamil versions of Christian names like Thomanthirai (Thoma+Andhre) for Thomas Andrew or Soosaiyar for Joseph or even Siluvai for Cross which, perhaps, is hardly popular as a name for a person except among Tamilian Catholics. And the parish church is their ‘pangu koyil’, their parish temple. Bolstered with contextual historical details from 1930 to 1985, the narrative grows highly textured with multiple implications. National and regional movements like Gandhi’s salt march and the rise of the DMK impact the local community as much as the ethnic riots in Sri Lanka, the Boat Mail connecting Talaimannar in Sri Lanka to Dhanushkodi in the south-eastern tip of Tamil Nadu and the daily news from the Tiruchi radio station, Akashvani. In November, 1945, the local communities ‘pray for the souls of the Japanese wiped out by the atom bomb’ (p. 112). But change comes imperceptibly in the form of technological development, in the guise of progress that could be a kind of regression in the long run; nylon nets replace the more fish-friendly jute and cotton ones, the native craft of building the kattamaran becomes obsolete as mechanized trawlers exploit the sea even as the parish priests misuse funds meant for charitable use. Ocean Rimmed World does just that. It widens our horizons, empathy and potential to think beyond ourselves and our short-term needs. Like Esterine Kire’s When the River Sleeps, set in the mountains of Nagaland, Ocean Rimmed World lends itself to ecocriticism for both novelists are concerned with reclaiming a lost way of life with faith in divine providence and respect for environment. G Geetha has done an amazing job translating the monumental Aazhi Soozh Ulagu. She has preserved the orality of the text as much by translating proverbs, ‘He who has long hair gathers it up in a knot’ or advice, ‘An angry man is dim-witted, remember that’, as by retaining the original expressions from the local Tamil dialect. Preserving ‘el’ as an expression of encouragement by elderly fishermen to the youngsters struggling to find their feet on the sea is invaluable in the context of losing the very art of fishing from a kattamaran as well as the camaraderie that went with it. She has managed to retain the local flavour with dexterity, conveying the prosaic intricacies of building the catamaran together with the pride and joy of the master builder. Her mastery over interpolations as a stylistic device in translation transfers not only the meaning but also the flavour of the original while doing away with footnotes that distract the reader from the ambience of the setting. The translation is so near-perfect that an ‘Alas!’ here and there cries out to be, ‘Ayyo!’ and ‘Mother Sea’ jars; ‘kadal aatha’ would have gone better with the flow. But that seems like quibbling. The exhaustive glossary provides ample extra support. To a reader familiar with both the languages, the text should read like a duet. Thanks to Mini Krishnan’s meticulous editing, it is easy to get lost in the book. Shiv Viswanathan’s Introduction with its ethnographic perspective provides insights that deepen one’s enjoyment of the novel. Susheela Punitha has translated from Kannada to English excerpts on theatre in Karnataka, for Regional Theatre Histories, and Samboli, A Life-Story by Lakshman (2018, Niyogi Books), Hundreds of Streets to the Palace of Lights and Other Stories, a collection of short stories by S Diwakar, (OUP 2015), Dweepa, a novella by Na D’Souza, (OUP 2013), Asprushyaru, a novel by Vaidehi, as Vasudeva’s Family (OUP, 2012), and Bharathipura, a novel by UR Ananthamurthy (OUP 2010). She was awarded the Sahitya Akadami Award for Translation (English), 2015.